During First Contact, a team of Borg were shot out of the sky and crashed in the Arctic where they stayed frozen for 100 years. This is their story. As three human scientists plod through the Arctic scanning around, they come across the ruins of a Borg sphere. Except they have no idea what Borg are. So they find these strange cybernetic zombies and then bring them in for study. Because that's what scientists do: they poke around. 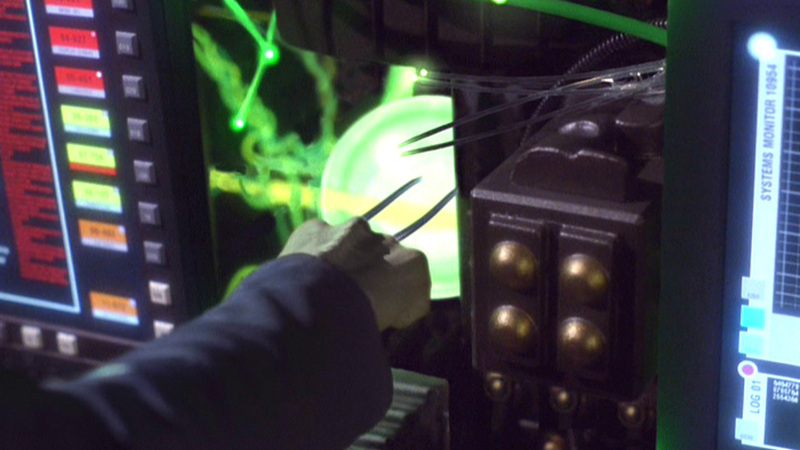 They spend the whole first act pretty much just confirming to the audience that these are, in fact, Borg. But they do it in a very effective, horror-story kind of way. The scientists bring the cybernetic zombies in and give them a good studying. Luckily the Borg have been offline for a good 100 years, so they don't appear to be a threat... yet. Then they find that there are nanoprobes repairing the cells inside the cyber-zombies systems. All alone in the middle of the Arctic, the team of three scientists are overcome by two Borg, who promptly repair their broken sphere using parts from a transport and the lab, and fly away into space. Finally, we get back to Enterprise. They are tasked with the mission to chase after the cyber-zombies who were last scene exiting the Sol system at warp 3.9 on a transport that is supposed to only be able to go 1.4. They rush off to meet it and along the way study the data the science team had gathered on the strange aliens. It is perhaps worth noting that there is now information on the Borg in Starfleet records. Granted, they don't have a name, but it is there... and the dots could have been connected when Picard came along. But they weren't. Later on, Archer even pulls from the records an obscure drunken tirade from Zefram Cochrane in which he spilled the beans of how the Borg were around during First Contact. Archer is able to draw from that, but Picard can't draw from Archer's experience? That's a little sketchy to me. And then the Borg wiped C-3P0's memory banks. Soon enough, the Enterprise gets a distress call from a Tarkalean ship under the attack of "unknown aliens". That's all Archer needs to turn toward them in search of the Borg. When they get there, they find the human transport ship to be heavily modified in a Borg-ish kind of way and it's using a cutting beam on the Tarkalean ship. The Enterprise fires on the Borg, disables its weapons and it flies away. And then the surviving Tarkaleans are seen in sick bay. They have been assimilated. Their faces are turning gray, but they're not fully Borg yet. In either case, it's time for Phlox to get to work! Of course Phlox has an easy time figuring out what's going on with them. Unfortunately, he can't offer much in the way of a cure early on. He discovers the nanoprobes and immediately sets to work trying to find a way to shut them down. 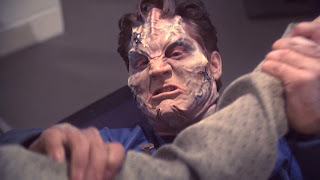 Unfortunately, in the middle of this process, one of the Tarkaleans wakes up, fully Borg-ified, and assimilates Phlox before throwing him across the room, knocking him unconscious. The other Tarkalean Borg wakes up and the two of them start to run amok around the Enterprise. Before Phlox wakes up, he hears the Borg Collective in his mind muttering all sorts of unintelligible things. He's now in a race to save himself before becoming fully Borg-ified and able to do nothing apart from what the Collective tells him. The loose drones start to make modifications to the Enterprise. Reed and a team of security officers attempt to stop them, but, of course, they adapt to phase pistol fire. I should note that the fact that these drones are still missing prosthetics and exo-plating is an awesome addition to the script because if they were that far gone, the NX-01 would have no chance against them. As it is, they have a difficult time luring them into an airlock and ejecting them into open space. And before they can do that, the drones are able to make some heavy modifications. Back in sickbay, Phlox figures out that the nanoprobes' processors are susceptible to omicron radiation. He'll have to subject himself to a high dosage in order to get rid of every single one which will be extremely painful. But he's starting to get grayer and grayer. The situation is dire. So dire, in fact, that he tells Archer to kill him if the treatment fails. Yeah. It just got real. 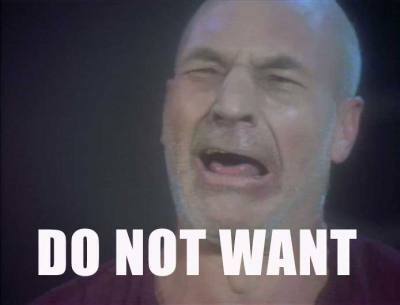 So the Enterprise continues on their way to get rid of the Borg ship and save the galaxy. They finally find it and cripple it, but then a transmission comes in that activates the modified circuits the drones had screwed with earlier. It shuts down all the weapons and main power systems on the Enterprise. Angry, Archer hails the Borg ship. He attempts to introduce himself but is cut off by the Borg saying "You will be assimilated. Resistance is futile." Wait. Hang on. That is not what they're supposed to say. The normal Borg greeting is "We are the Borg. You will be assimilated... etc." They did not identify themselves! That is just as much against continuity as the Borg info being in Starfleet data banks. One system the un-named cyber-zombies forgot to shut down: the transporter system. Reed gets his modified weapons ready and heads toward the transporter to get on board the Borg ship. Meanwhile, in sick bay, Phlox has severely deteriorated, but he's ready to start his omicron radiation treatment. He tells a security guard to push a button as soon as he's loaded into the chamber. And as soon as he's inside, he winces in pain. Reed and Archer beam onto the Borg ship and while they look around, they find some drones just chillin'. They shoot at them like idiots because they've never met Borg before. And now the Borg register them as threats. So they have to take all of them out. At the same time, the Borg succeed in beaming a few drones onto the Enterprise. So now two things have to happen: 1) Reed and Archer have to destroy an EPS conduit and 2) T'Pol has to get the Borg off the Enterprise. So, Reed sets a bomb on the EPS conduit and they beam out before more drones can get to them. 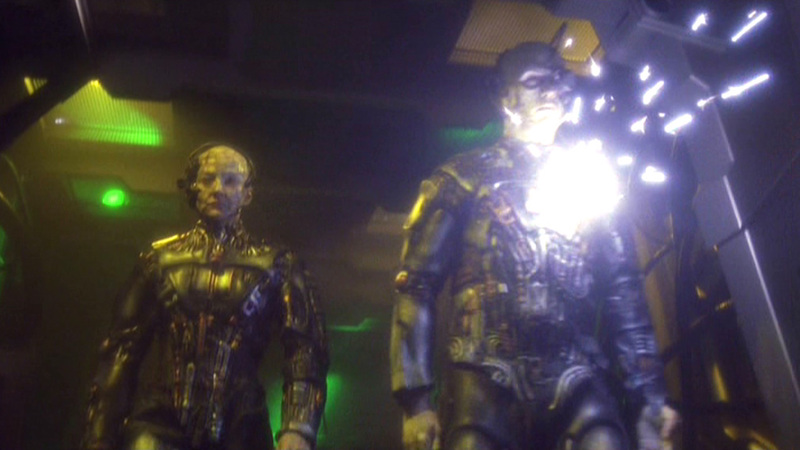 When they arrive back on Enterprise, they activate the bomb and the power system on the Borg ship shuts down. This obviously freaks out the drone landing party, so they immediately beam off of the Enterprise, and back onto their own disabled ship to affect repairs. Repairs are made quickly, so Archer orders they immediately fire torpedoes at it. AND THE BORG ARE DESTROYED! YAY! The episode ends on an ominous note. Phlox, who is recovering from his radiation treatment, but free from the nanoprobes, tells T'Pol and Archer that while he was infected he heard the Borg sending a message with the coordinates of Earth. They figure that it would take several centuries before the message reaches its destination deep in the Delta Quadrant, if it makes it there at all, but Archer is inconsolable, noting that they may have only delayed the invasion until the 24th century. In "Acquisition", Archer and the gang discovered Farengi, but they were never named. That was OK, though, because the Farengi were just a nuisance and Starfleet didn't really need to know about them. The Borg, on the other hand, are a serious threat, and any information about them is extremely important. Name or no name, there needs to be a record on file of cyber-zombies that are this big of a threat. Despite these discrepancies, this was an awesome episode. The Borg are always good for some awesomeness, and watching some relatively weak ones wake up out of a 100-year rest to reek havoc on the NX-01 is just... It warms my little Trekkie heart.